Maine Sen. Susan Collins complained Tuesday that coverage of her role in crafting the Republican tax bill had been “unbelievably sexist” and had failed to note the ways in which she had gotten the law shaped to her liking. The case of clear-cut sexism she pointed to was The New York Times reporting that she failed to cry when meeting with an ALS patient who advocated against repealing the healthcare individual mandate. As Collins notes, it’s hard to imagine that line being written about a male senator, and The Times removed the line after she complained. But that’s just a misplaced bit of colour in a story. The bigger problem with the Collins narrative is the idea that she got nothing in exchange for her vote for the bill, and therefore she must have been “duped” in exchange for her vote: That she is guilty of being an incompetent senator. I do think it is highly doubtful whether one of Collins’ key demands will be met. 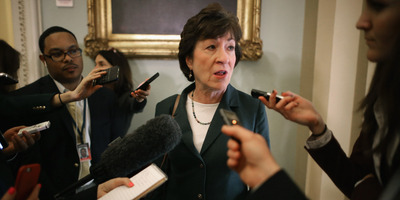 Collins says she has an ironclad commitment from Senate Majority Leader Mitch McConnell to move two bills that aim to stabilise the market for individual health insurance, which would do something to offset the disruption caused by the tax bill’s repeal of the individual mandate. House Republicans are strongly resistant to pass these bills, which they see as Obamacare “bailouts.” The president has sometimes indicated support for them, but he has also changed his mind repeatedly. But this is a tax bill. While solutions to shore up health insurance markets after the repeal of the individual mandate has been the key fixation for many national observers of Collins’ vote, it wasn’t the singular item she was looking for. She got her way on these issues, some of which are of particular importance in Maine, a state with a high income tax and an ageing population. Collins also says she was instrumental in blocking several unpopular provisions from the House version of the bill, including taxes on student loan interest and grad students’ waived tuition – though the student loan interest idea was so politically toxic I suspect it might have collapsed under its own weight anyway. No, Collins hasn’t gotten everything she wanted, and given the track record of this Congress there is a great likelihood she won’t get the insurance market bills she wants in 2018. But normally, when a lawmaker gets part of what they asked for in a bill, we call that an outcome of a negotiation, not a duping. Like many of her Republican colleagues, she has made the ridiculous claim that the bill may grow the economy enough to pay for itself. The economic effects of the tax bill are one area where I believe she has duped herself – as most Republican lawmakers have done. Finally, I want to reiterate something I wrote a few weeks ago: While repealing the individual mandate will somewhat increase insurance premiums in the individual market (only for unsubsidized insurance buyers – for people making less than 400% of the federal poverty line, the premium increase will be 100% covered by a government subsidy), it is not the death blow to Obamacare the president is making it out to be. The individual mandate is just one of several ways federal government policy encourages people to carry health insurance, and far from the most important one. The keystone of coverage in Obamacare is the spending – spending on subsidies that reduce the price of insurance below its true cost, and grants to states to expand Medicaid. The Congressional Budget Office has revised downward its estimates of how much mandate repeal will raise insurance premiums for unsubsidized buyers – an acknowledgement that the mandate already wasn’t doing as much as it was supposed to do to encourage healthy people to buy insurance coverage, and therefore to hold down premiums. In the long run, it will be need to replaced with more popular measures that encourage insurance coverage by reducing its cost to buyers. One of Collins’ ideas – a reinsurance program – would help with that. And even if the bills she wants don’t get through this Congress, such an approach is likely to get traction if Democrats retake one or both houses of Congress next year. All of which is to say: Collins is wrong about the merits of the Republican tax bill, which gives most of its benefits to the rich and won’t do nearly as much to help the economy as she thinks. But I think she was right about whether preserving the individual mandate was a good hill to die on, in the process of crafting that bill.